Tucker is an easy soul, with a gentle disposition and a spirit. He may be an older gent at 13 years, but his little feet still prance about when he wants to play. He’s a small fella with a big personality, looking for a home that can keep up with his spunky nature. 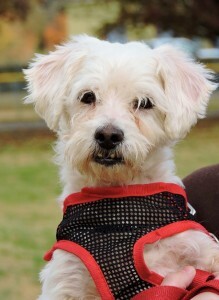 Tucker is a handsome white poodle mix that has the most endearing under bite to give him even more character. Amiable with others, dogs and cats alike find Tucker to be an excellent buddy, but it’s a human’s heart he’s out to charm. He’s been searching for a home with a little love to spare. Tucker knows that there is a loving family out in the great big world that needs him to fill their hearts with the love only his kind eyes and happy wags can provide. Julia is a classic starlet ready to showcase her talents. 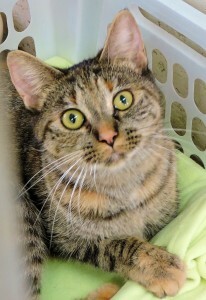 This petite feline lady is well versed in entertainment and ready to leap and pounce around in the hopes of making you smile. Like any leading lady, Julia plays well with everyone and fits right into any scene. 3 years old and ready for her big debut, she has been primping her brown tabby coat, flecked with orange and gold, being sure to be ready for a standout performance for when you visit. Well-mannered with a dash of sass this rising star is ready to take center stage in a family all her own. Julia is ready to play a new part as your new family pet in a role that lasts a lifetime. She’s rehearsed day and night at keeping her kennel clean and her roommates happy and now she’s all set to hit the big times and gain a home to shine right into.